The pretty as a picture, Artville Cafe, stands on a quiet lane in Kalyan Nagar. And should be your go to place when you want to get in touch with the artist in you or just want to curl up with a book while sipping on coffee. Bangalore is home to some delightful cafes and we are happy to share that Artville is definitely one amongst them. Decked out like an art gallery, this is a quiet spot in Kalyan Nagar where you can swing by to browse through art or spend the day reading and working. The best bit is that Artville is a whole lotta more than just a coffee house. Here you can not just buy art but become an artist yourself. At the cafe, they offer a regular menu lineup that includes sandwiches, cutlets, burgers, and basic pasta dishes. Frankly, there’s not much that stands out. But the dishes are well-priced and perfect for a quick bite. However, their coffee is quite good and you won’t regret ordering cup after steaming cup. We also enjoyed the Mango and Ginger Refresher. The thick drink made with canned mangoes had a lovely hit of ginger that cut through the fruit’s sweetness and also added a freshness to the drink. The place also has racks of books that you can pick up while here. We recommend that you grab one of the comfy chairs and sink into that page turner. They don’t really bother you so feel free to spend hours reading while sipping on a hot cuppa. We also spotted people with their laptops and for an extra fee (around INR 200 for a daily pass) you can enjoy unlimited WiFi and work through the day. 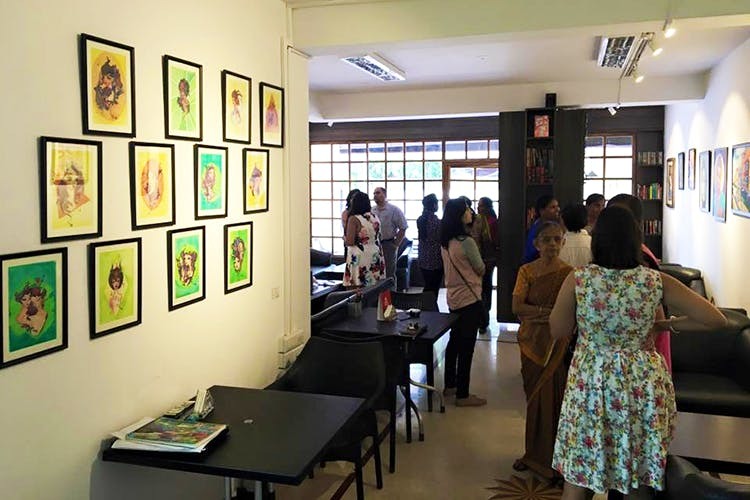 All around you, you’ll find art works hung up on white walls and usually features works from budding and established artists that you can snap up for as little as INR 2000. There’s also an Art Academy attached to the cafe at which you can sign up. If you are serious about art, they have a year-long, certificate course that costs between INR 4,500 – INR 9,000 (per quarter) depending on the level. If you are looking to delve into as a hobby, they also offer month-long crash courses. For around 5k, you can pick up skills in mediums like acrylic, oil, charcoal and pastels.